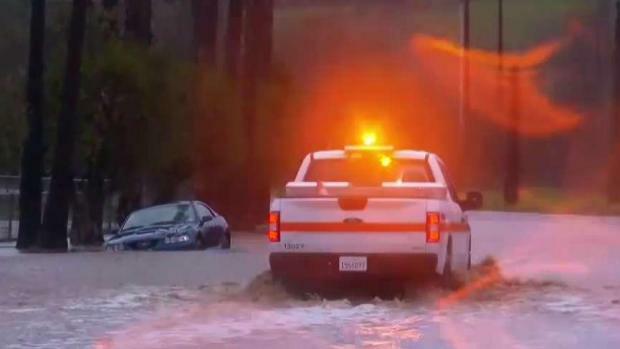 Feet of water covered dozens of San Diego County roadways, trapping residents inside their homes and submerging cars that tried to cross Thursday, as the National Service issued flash flood warnings for the majority of the county. 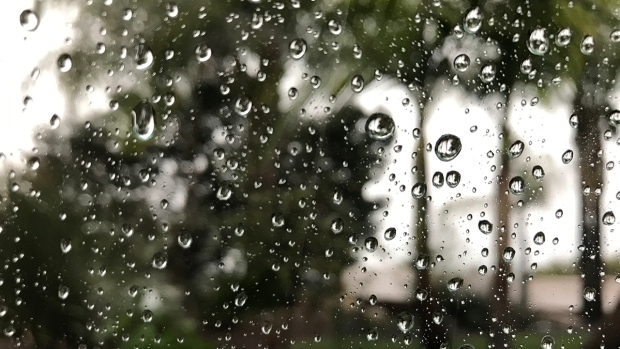 A Flash flood warning was issued at 9 a.m. Thursday for the northwestern portion of the county, including Oceanside, Carlsbad, Vista, Encinitas, Poway, Del Mar, Fallbrook, Valley Center, Escondido and Camp Pendleton. Heavy rain brought muddy flooding to the North County. NBC 7's Melissa Adan has more. An hour later, the alert was expanded to include southeastern San Diego County. Areas that have the potential for flooding include Chula Vista, El Cajon, La Mesa, Poway, Ramona, Alpine, portions of the San Diego city limits, Mission Valley, Hwy 78 Between Borrego Springs Road and Ocotillo Wells, Cuyamaca Rancho State Park and Borrego Springs. By the afternoon, western portions of the county were also under flash flood warning due to potentially dangerous flooding of the San Luis Rey and Santa Margarita rivers in North County. A flash flood warning was also in effect for the area near the San Diego River at Fashion Valley. As water levels rose Thursday, a Ramona homeowner trapped by flooding outside his home used a kayak to get out. He told NBC 7's Artie Ojeda that water was seeping into his home. “It looked like the movie ‘Titanic,’ stuff floating all through the house,” Pearsall said. Pearsall and his wife have lived in their Ramona home for five years. He said they’ll only live there for a few more years now. Fout worried the flooding would enter his home, something he’s seen a few years ago. He took an alternate route because the high water levels blocked roadways surrounding a nearby creek in Ramona. Ramona suffered flooding following heavy rain, prompting major difficulties for drivers in the area. NBC 7's Artie Ojeda has more. Earlier in the day, flooding trapped a Ford Mustang that attempted to cross Camino Del Rey in the North County. A North County Fire Protection District ambulance waded through the water to check on the car but no one was in need of rescue, the agency said. 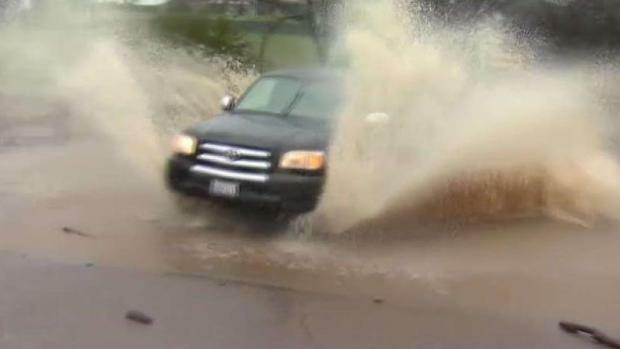 A delivery driver made it across the flooded roadway in his work truck but described the scary situation to NBC 7. "I feel like I was going deeper and deeper in it," Yibran Silva said. A Cal Fire engine rolled over on a rainy old Highway 395 in Bonsall Thursday morning, though it was still under investigation if wet roadways contributed to the crash that left three firefighters injured. 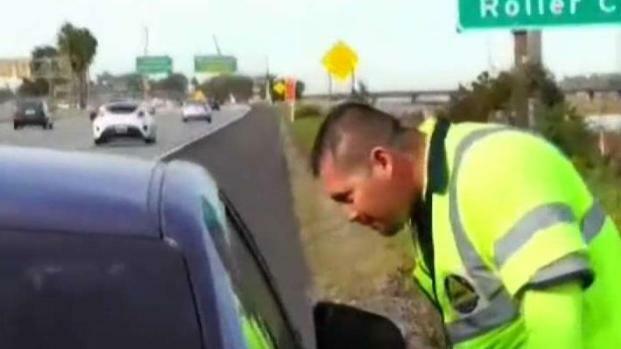 NBC 7's Ashley Matthews shares details on 511, a roadside assistance service that could come in handy on San Diego's slick roads. The service is available to motorists rain or shine. Also in the North County, a busy freeway on-ramp from El Camino Real to State Route 78 in was closed due to flooding at the bottom of the slope. In the East County, flooding at SR-67 and Riverford Road caused a car to slide off the roadway and into a ditch, Southwick said. In Chula Vista, a man said he was on the edge of his seat watching out for flooding near his home. Sergio Melendrez said his six-year-old daughter was “pretty traumatized” during a similar storm in December 2018 and wants to be more vigilant this time around. “We didn’t want to go to sleep until, you know, we figured out what the situation is going to be,” Melendrez said. 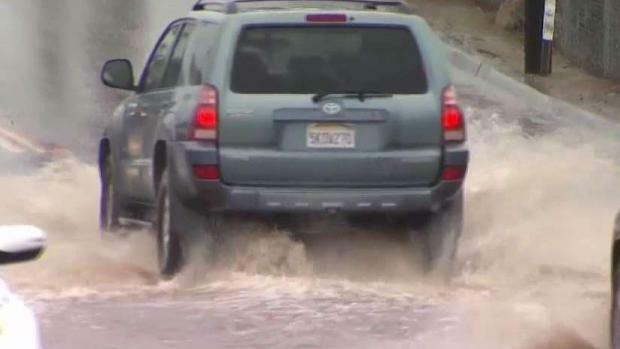 As another storm hits San Diego, rain swept through North County, flooding some streets. NBC 7's Ashley Matthews is in Escondido with more on the weather. The City of Chula Vista provided up to 10 sandbags for residents, but Melendrez said his neighbors helped get more to prevent any flooding. “We feel very fortunate that we have the support of our neighbors,” he said. “A lot of family memorabilia and stuff like that – just gone. And those you can’t really put a price on, but now, we just try to stay vigilant,” he said. Melendrez also lives with his 95-year-old father-in-law and wants to keep his family safe. A man who lives near Los Penasquitos Canyon Trail recorded a video showing the reserve’s creek rushing with water following a burst of heavy rainfall. Blake DeBock said it was the “most water” he’s ever seen come through the creek, reaching heights 20 to 30 feet higher than normal. The video was taken near the Los Peñasquitos Waterfall. The Jamul-Dulzura Union School District canceled its “Route A” bus schedule for Thursday. The district said this route was stopped due to boulders in the road, flooding, and road deterioration. Students who use this route will be taken to the Jamul Intermediate School office after classes. Parents are asked to pick up their children there. While half the county was under flash flood warnings, the rest of the county was under a flash flood advisory until noon Thursday. Once the advisory expires, a flash flood watch would take over until 10 p.m. The advisory warned that heavy rainfall could trigger flash flooding in low-lying areas or on streets, especially in areas scorched by recent wildfires. The NWS warned drivers to turn around if they come across a flooded roadway. 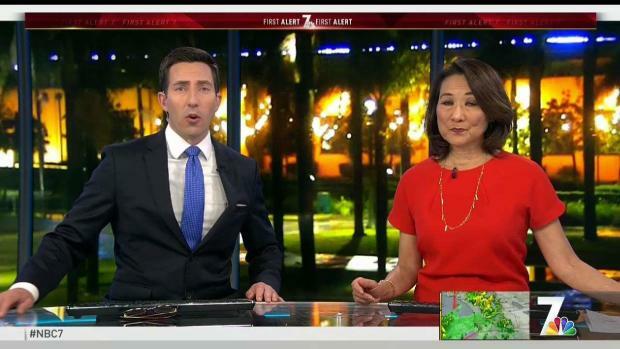 NBC 7's Brittany Ford reports on the storm from Lakeside on Feb. 14, 2019. NBC 7 Meteorologist Sheena Parveen said heavy downpours would move in waves as the storm swept the county. The above-average rainfall was due in part to a subtropical jet stream that pulls tropical moisture into the region. Combined with the storm system, it creates an atmospheric river, Parveen said. “This is tropical moisture so you can bet these downpours today, they’re going to be the blinding type. When you’re driving. It’s going to be very hard to see in some instances," Parveen said. 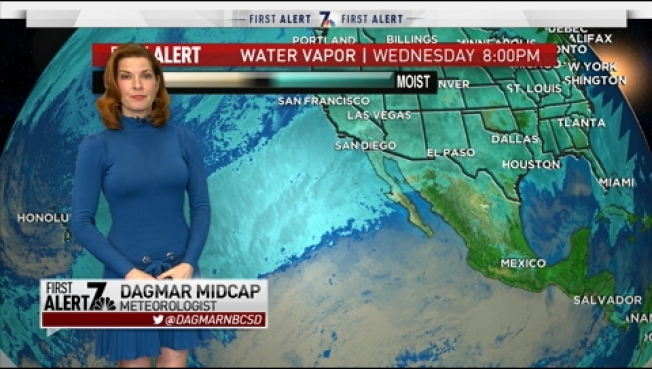 NBC 7 Meteorologist Sheena Parveen takes a look at what's in the cards for this next storm in her Wednesday morning forecast. Flooded roadways and severe weather was forcing schools, hospitals and even theme parks to issue closures Thursday. The San Diego County Office of Education said schools in the following districts would be closed Friday. Schools in the Mountain Empire Unified School District, two schools within the Oceanside Unified School District and Vallecitos Elementary School sent students home early Thursday due to the rain. The Grossmont Union High School District said Monte Vista High School would be closed Friday due to a water main break. The schools closed in Oceanside were within Marine Corps Base Camp Pendleton, where severe weather forced several base officials to release all non-essential employees due to road closures and base exit closures. Naval Hospital Camp Pendleton also closed several clinics. SeaWorld San Diego was forced to close for the day because of the rain. The park said the safety of their guests was their main priority. Transportation services were also affected. The North County Transit District (NCTD) said multiple bus routes were experiencing delays including routes 388, 359, 323, 302, 303, 392,395 and 315. NCTD's SPRINTER experienced cancelations and delays as well. To check new times and to learn more about speed restrictions in rainy weather, go to its website. Showers would begin to taper off at about 6 p.m. Thursday, but chances for rain will last until the weekend, Parveen said. 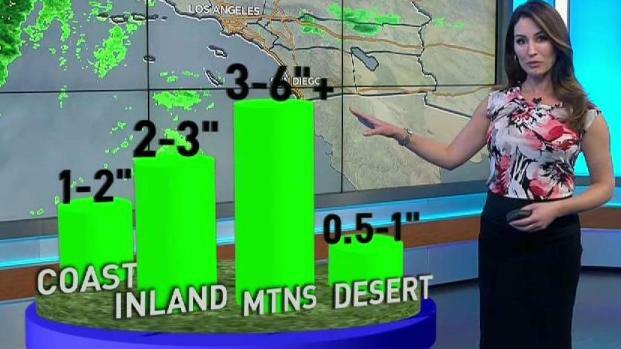 In total, the storm could bring 2 to 3 inches of rain to the coast and inland valleys; in the mountains 6 inches or more of rain is possible and in the deserts, less than a half-inch is expected. A high wind warning for the mountains was downgraded early Thursday to an advisory, as wind gusts lowered slightly from 65 miles per hour to 55 mph. Breezy conditions with winds averaging 25 to 35 mph were still expected in all other parts of the county. NBC 7's Audra Stafford tracks the Valentine's Day storm from San Diego's South Bay.